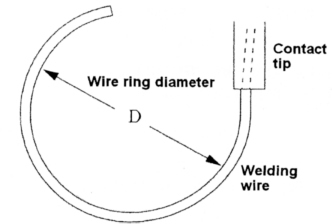 A wire ring with an excessive diameter can cause an irregular electrical contact between the contact tip and the wire, thereby causing an unstable arc. In automatic gas metal arc welding (GMAW) with robots and exclusive-use automatic systems you may adjust the wire straightener in order to deliver the welding wire as straight as possible from the contact tip and thus facilitate better wire tracking onto the welding line. This method, however, can have an adverse effect on the regular electrical contact between the contact tip and the wire, thereby causing an unstable arc. This is a typical cause of unstable arc, even though the wire feeding is smooth. The tip-to-wire irregular electrical contact can occur where the contact pressure of the wire onto the contact tip is insufficient. The wire-to-tip contact pressure is predominantly affected by the diameter of the wire ring (Fie. 1). 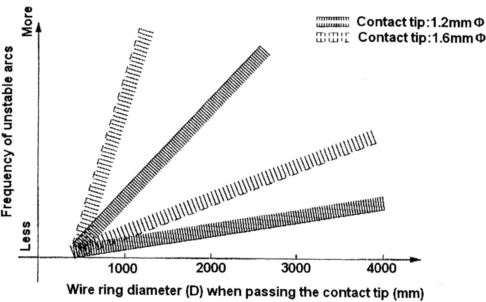 As the wire ring diameter increases, the wire-to-tip contact pressure decreases; consequently, more unstable arcs can occur as shown in Fig. 2. Therefore, the diameter must be controlled small enough ―normally 600 mm or smaller ― by adjusting the wire straightener and pressure roller of the wire feeder to maintain stable wire-to-tip contact pressure. In addition, as shown in Fig. 2, the use of a loose contact tip having an excessively large inside diameter over the wire diameter or being worn out causes more unstable arcs. An unstable arc caused by tip-to-wire irregular electrical contact can also cause fusion at the interface between the contact tip and wire, which can damage the inside surface of the contact tip and markedly increase the wire feeding resistance, thereby damaging the wire surface at the wire feeding roller. Therefore, this electrical trouble can cause subsequent wire feeding trouble. To prevent such multiple troubles, when irregular electrical contact causes seriously unstable arcs or arc cutting, you should not only renew the contact tip, but also remove all the wire extended from the wire pressure roller to the welding torch through the conduit. Take preventive measures against the irregular electrical contact before restarting welding. Unstable arc can also be caused by an excessively long or small diameter welding cable due to a voltage drop. GMAW power sources are designed so that they perform best when the welding cable, which has a specified diameter according to the rated welding current, is extended 5-l()m long in general. Therefore, the use of a cable that is either longer or thinner can cause poor arc stability due to a voltage drop. In order to overcome this trouble, increase the output terminal voltage or use a thicker ― thus lower electrical resistance ― welding cable to compensate the voltage drop. When a long welding cable is spiraled during use, the arc can become more unstable because of an increase of inductance of the welding cable. This is why a long welding cable should be kept straight in use.